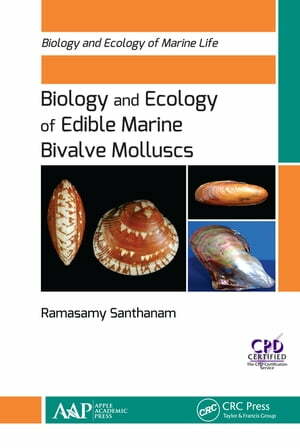 Collins Booksellers - Biology and Ecology of Edible Marine Bivalve Molluscs by Ramasamy Santhanam, 9781351619332. Buy this book online. This comprehensive volume provides a plethora of first-hand information on the diversity, biology, and ecology of edible marine bivalve molluscs. It covers the biology of edible marine bivalves; profiles about 180 species, providing information on their habitat, distribution, morphology, food and feeding, reproduction, conservation status, etc. ; discusses their nutritional values; examines their pharmaceutical value; and looks at their diseases and parasites. This abundance of knowledge is presented in an easy-to-read style with informative illustrations. Marine bivalve molluscs play important roles in the marine ecosystems by filtering water and serving as habitat and prey for a variety of sea life. This diverse group of species, estimated at around 9,200, inhabits virtually the entire world’s oceans, from the balmy tropics to the sub-zero Arctic, and from deep oceans to sandy and rocky shorelines. Among the marine bivalves, a total of 180 species (including mussels, oysters, scallops, cockles, and clams) have long been a part of the diet of coastal human populations. Many species of marine bivalves are also commercially important for other purposes, such as pearls and shells for jewelry and decoration. The volume, part of the Biology and Ecology of Marine Life book series, will be of great use to students and researchers in fisheries science, marine biology, aquatic biology, and zoology.